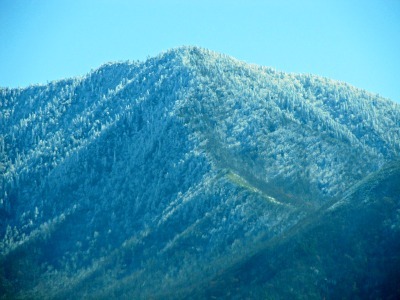 The Great Smoky Mountain's Highest Peak! Visiting Mt LeConte in the Great Smoky Mountains National Park is like climbing to "the top of the world!" The climate in Mt LeConte is great if you're into cooler weather. Summers here are comfortable with temperatures staying around 80 degrees, or below. Winters are cold with lots of snow! Average snowfall is anywhere from around 39 inches at the bottom to over 70 inches at the top! This peak appears to be more wet than those at the lower elevations. Located in Sevier County, TN, it's the Smoky Mountain's third highest peak at 6,593 ft (2,010 m) next to Clingman's Dome at 6,643 ft. and Mount Guyot at 6,621 ft. Around here, we consider it the "highest" peak mainly because it is the highest peak with all its borders inside Tennessee. This area is famous for two reasons. It's one of the Smokies' biggest hike challenges, and it's home to a resort that stands higher in elevation than any other in the Eastern United States! The LeConte Lodge is a small, however it's popularity is widely known! . First, it was a tent, that grew into a single cabin! Now it is a series of small personal log cabins complete with dining. The lodge is open from March through November and accommodates about 50 guests. These are primitive accommodations folks - meaning the only transportation up here is your own two legs! 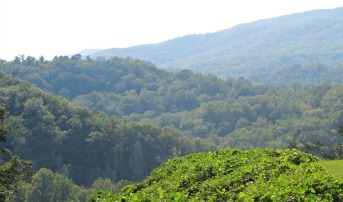 However, there are five beautiful trails you can choose from to hike! So give yourself a long stretch, and start "hoofin" it! It's one of the most exciting adventures you'll ever experience! Since you'll be doing a bit of walking, I'm sure you're interested in learning more about your (umm) "little" walk! As I said, there are five trails, each with spur trails leading to individual peaks. Take a camera to capture the beauty of scenic overlooks, peaceful wooded areas, and plenty of great wildlife. Appalachian Trail style shelters are available for overnight stays, however you've got to get a back country permit! It's also important to call the National Park Service to make reservations. The number is (865) 436-1200. Because people from all over the world hike these trails, they can become quite crowded at times. Alum Cave and Rainbow Falls "play host" to most visitors, especially those looking for scenic beauty early on. Any time you plan a hike, be sure you have good walking shoes, a backpack filled with necessities, and a compass. Hiking Mt-LeConte and the Great Smoky Mountains offers plenty of excitement, and fun, however, you must be prepared!